What I love about this city is the adventure and discoveries. New York is like a real jungle and walking though the dense thicket of things and people is like a safari, revealing surprises at every turn. While walking through the East Village and passing by the island that is home to the Astor Place cube, I discovered a jungle gym, with an assortment of unusual steel forms (that appeared to be bike racks) anchored to the ground. My immediate thought was to get a photo and my focus primarily about composition and other photographic concerns. See second photo with cube here. It never occurred to me to question why these objects were here or why the collection was so disparate. The extreme variety of shapes and sizes should have tipped me off that there was more than meets the eye. I had essentially forgotten the photos - a quick scan of them on my flash card made me question whether this motley crew of bike racks were blog-worthy. However, the forms were rather attractive and a quick online search revealed a pleasant surprise - these were the nine finalists in the "CityRack" Design Competition for New City Bike-Parking Standard by the New York City Department of Transportation. See the nine designs and information about the competition here. The competition drew over 200 entrants from 24 states and 26 nations. An international jury of six will decide the first, second and third place winners. The winning design will be announced at the Cooper-Hewitt Museum during National Design Week (October 19-25, 2008). 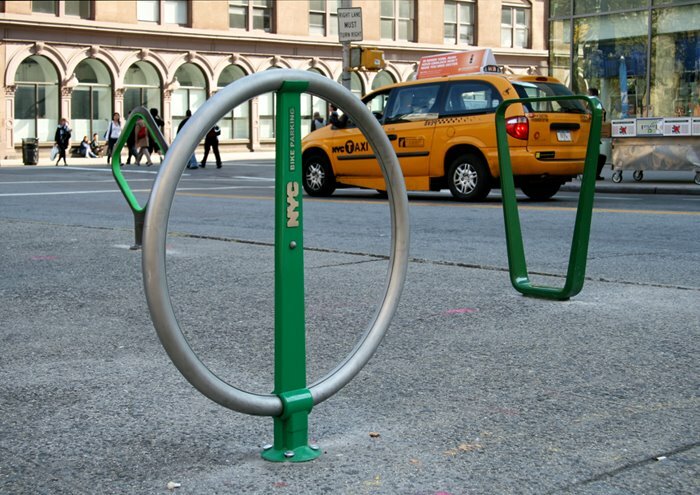 The first place winner will receive $10,000 and transfer design rights to the City of New York which intends to use the winning sidewalk bike rack design as its new prototype for bicycle parking. There are currently more than 5000 racks throughout the city with a design that is over 10 years old. As I have written about before, the overriding considerations in this city for things in public spaces is their ability to withstand vandalism, abuse and heavy use. For better or for worse, these things supersede all others and utility rules. See my posting Very Practical here. What I love about these designs is that it is clear that the entrants really understood the harsh NYC environment - all the designs are minimalist and look like they would survive.